Delptronics now offers a new service. We will design a custom interactive music exhibit for your museum, school, festival, or public space. Contact us today to discuss your project. 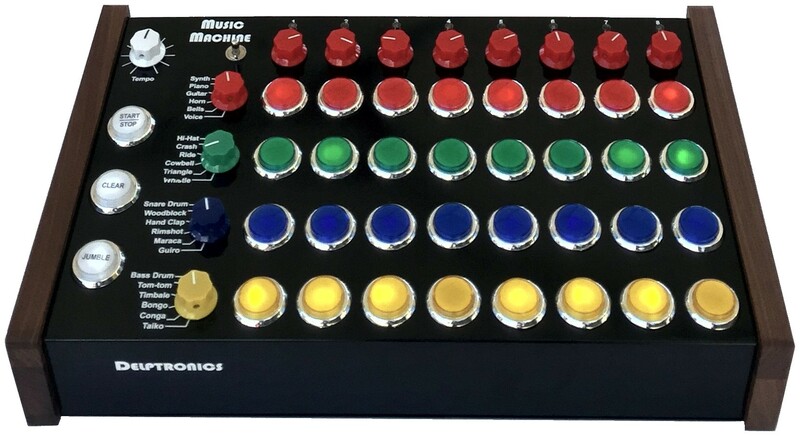 The Delptronics Music Machine is a proof of concept device that demonstrates some of the ideas that Delptronics can incorporate into a custom interactive music exhibit. The Music Machine is a fun way to learn about rhythm and music. It is designed to be easily understood without the need for instructions. The goal is to learn through experimentation, and to have fun doing it. The Music Machine debuted at SXSW Create (March 13-15, 2015) during which, Slashdot interviewed Mickey Delp about the machine. 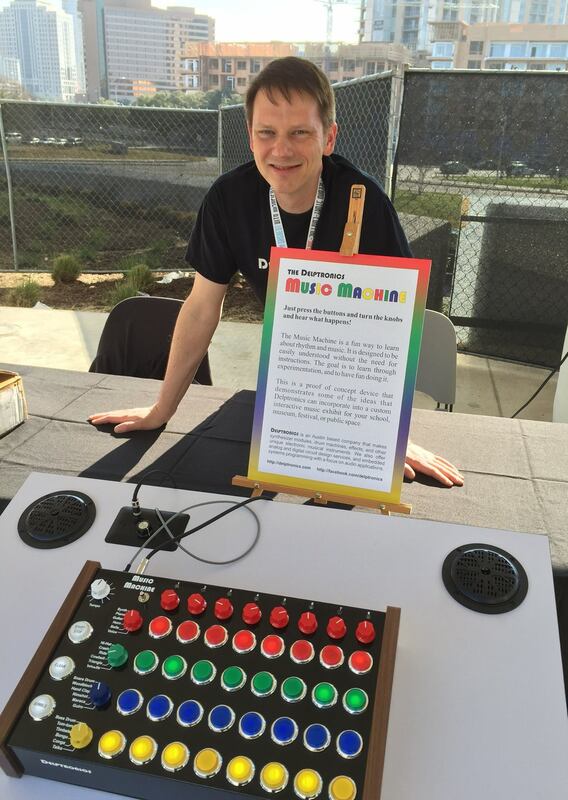 It was exhibited again at Austin Maker Faire (May 16-17, 2015). Both kids and adults really enjoyed playing with it. People literally lined up to get their hands on it. It was fascinating to watch people of all ages interact with the Machine. We learned a lot, and modified the Machine&apos;s programming accordingly. Mickey presented at Dorkbot Austin where he went into detail about what we learned about designing a user interface for a public exhibit. 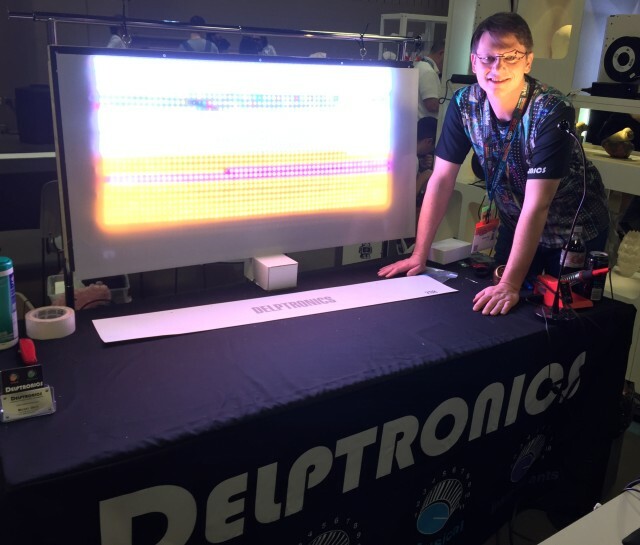 Delptronics has built several LED projects for our customers (see design services). Building on that experience, we created a large 60x32 LED Matrix. The Matrix was actually under construction live during SXSW Create 2016. We powered it up on the last day of Create, and it worked! The picture to the right was taken right after it came alive. We are certainly not the first people to think of using addressable LED strips (sometimes called Neopixels) to create a display. However, most of the existing projects use the display as a simple sign, slide show viewer, or low-res video wall. We wanted to do something more interactive. To that end, we wrote a game engine specifically for the Matrix. We then solicited programmers and game designers to create games targeting the Matrix. We wrote an emulator for the LED Matrix in the Processing environment so that developers could write games for it on their own computers without needing to have an actual LED Matrix. The end result of that project was six amazing low res games. For full details on the LED Matrix, read Mickey&apos;s blog article. At Fantastic Arcade 2016, Mickey Delp participated in a panel on "Making Games on Weird Hardware".